This entry was posted on 6th February, 2013 by Haxnicks. 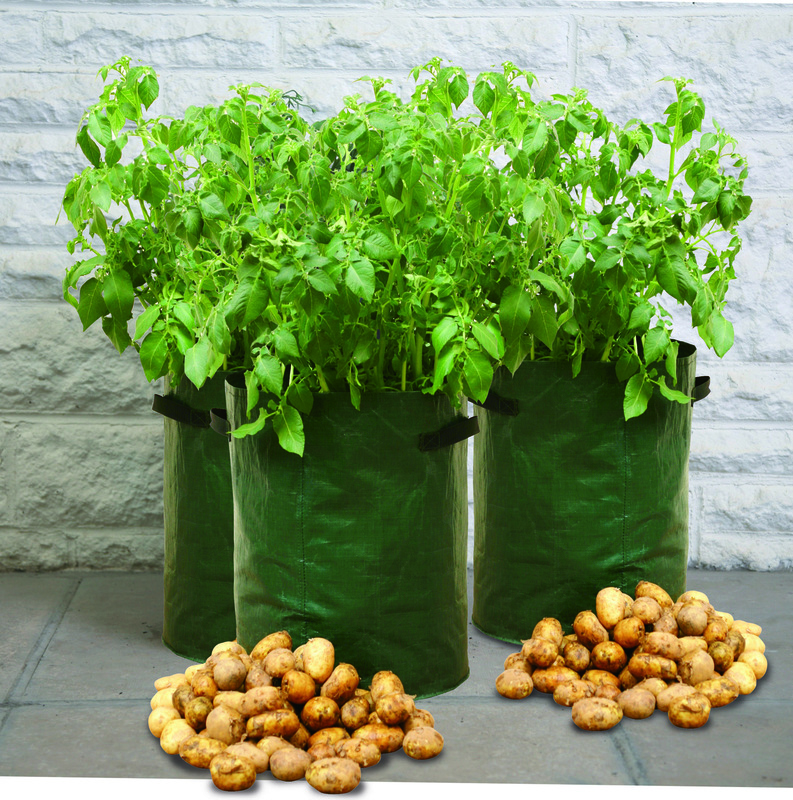 If you have a small or urban garden potatoes are the perfect veg to grow in a Haxnicks Patio Planter - we even have a special Patio Potato Planter! Seed potatoes are on sale from December and throughout the spring. Each Patio Planter is suitable for planting 3 seed tubers or 4 tubers if very small 'baby potatoes' are required. By planting each potato planter at 4 week intervals you will be able to harvest over a longer period. First you need to 'chit' your seed potatoes by placing them in a cool but frost-free place in egg boxes or shallow trays in full light, so that they can form sturdy shoots (chits) about 2.5cm (1 inch) long. This takes approximately 5 weeks. When they are ready to plant, you will need approximately 40 litres of good general purpose compost for each planter. Pour approximately 10cm (4 inches) into the bottom of the planter. Plant your seed potatoes, with the shoots or eyes facing upwards, and cover with 5cm (2 inches) of compost. Keep the compost slightly damp, but do not over-water. When the shoots have grown 7cm (3 inches) high, add another layer of compost to leave the tips of the shoots just showing, keeping the compost damp each time. Repeat this process until the compost and shoots are 3 cm (1 inch) from the top. When the Potato Planter is full and the leaves of the plants are showing, feed weekly with a high potash/ low nitrogen soluble plant food. If there is danger of frost, cover with fleece and remove when the frost has passed. When the plant produces small white or pink flowers your potatoes are ready to harvest. Simply dig down into the planter to see if your potatoes are ready, and look out for the planter bulging, another sign of good potato growth. Remove a few potatoes at a time, or tip the planter out to reveal a bumper harvest. If you want larger tubers then continue feeding and watering for another few weeks. When the potatoes are ready to harvest, you can always store them in a Haxnicks Jute Vegetable Sack!